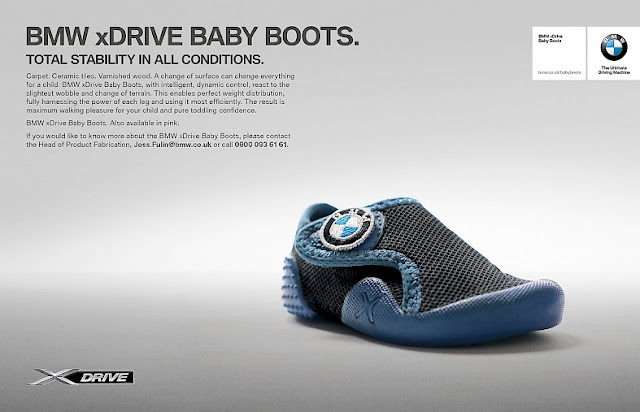 BMW April Fool 2016 ad - xDrive Baby Boots! "Carpet. Ceramic tiles. Varnished Wood. A change of surface can change everything for a child. BMW xDrive Baby Boots, with intelligent, dynamic control, react to the slightest wobble and change of terrain. This enables perfect weight distribution, fully harnessing the power of each leg and using it most efficiently. The result is maximum walking pleasure for your child and pure toddling confidence. BMW xDrive baby boots. Also available in pink. If you would like to know more about BMW xDrive Baby Boots, please contact the Head of Product Fabrication, joss.foolin@bmw.co.uk or call 0800 093 6161." Good fun again and another great example of BMW April Fools advertising!